It is hard to come up with a bright side when considering the problem of back fat. The bulge makes any idea of a smooth silhouette sound more like fantasy. The unwelcome rolls can also make it tough to wear some of summer’s slinkiest styles with confidence. Sure, we can’t see it but we know it is there…for a lot of us. And no, ignoring it will not make it go away. 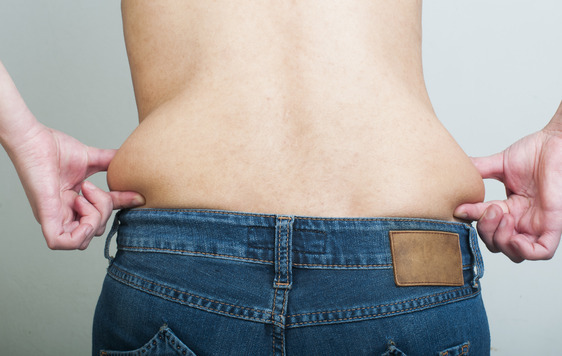 So what can be done about back fat? Turns out, a lot, read on for tips. Body fat is reduced with aerobic exercise. That includes the dreaded back fat. Aim for regular daily exercise of at least 45 minutes to burn calories and fat. More fat burned off with cardio means, you guessed it, less back fat. Regardless of your fitness level there is something you can do. Swimming, walking, running, biking and even jumping rope will help you see a difference in just a few weeks as long as you don’t reward yourself with high calorie foods after your workout. These exercises are a good complement to your cardio routine and will help you get rid of back fat. Lie on your belly with arms and legs fully extended. Without arching your back, raise your arms and legs as if in flight. Be sure to keep your head aligned with your spine. Hold the position for a few moments before returning your arms and legs to the floor. Repeat five times. Beginning on your stomach as you did in the previous exercise raise only your right arm and left leg. Again keep your head and neck aligned with your spine. Hold the position as long as you are able to comfortably remain in good form. Return arm and leg to the mat and then raise the opposite arm and leg. Continue for 5 reps per side. Stand with feet about hip-width apart. With a dumbbell in each hand at your side, bend forward keeping your spine straight. 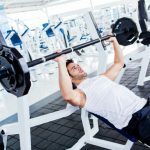 Your knees and elbows should be slightly bent as you lift your arms as high as your shoulders. Bring your arms back down and together remembering to breathe as you move your arms up and down. Repeat for 2 sets of ten. You can’t spot reduce. Getting rid of back fat requires an overall fitness plan that helps you burn fat as well as tone up. So it is really important to combine toning exercises with your cardio routine. Challenge yourself to do cardio at least three times a week and exercise three times a week, too. You can even watch your favorite shows while you do these exercises. Why not start today?